Vanda Scartezini is an Electronics Engineer and a Brazilian citizen, and graduated from college in 1970. Since then she has held many management positions with private technology companies and public institutions. She is the co-founder of and has been an active partner in Polo Consultores, a Brazilian IT consulting company – established in 1985 – and IT-Trend Consulting a company dedicated to the development of e-commerce and other internet based business – established in 2008. She also acts as President of ALTIS, a Software & Service outsourcing company, and as chair of the board of FITEC, an ICT R&D foundation. She is also an associate partner of Getulio Vargas Foundation Projects and member of the board of ABES, the Brazilian Software Industry Association, of INSTITUTO ELDORADO an IC Research Institution and Advisory Board member of Perform Management and Turnaround Consulting, a Brazilian Consulting Company. She served as National Secretary of Industrial Technology and as National Secretary of Information Technology in the Brazilian Federal Government. She is also former President of the Brazilian Patent Office. From 2000 until March 2004 she was the Brazilian representative on the ICANN Governmental Advisory Committee. She also served as GAC Vice Chair until March 2004. She has acted as Brazilian Government representative in many international missions around the world as well as an expert and consultant for international institutions. She was honored with many of the major prizes in the Brazilian IT Industry. She is also honorable member of Abranet, the IST Brazilian Association, and of the Brazilian Chamber of Electronic Commerce. Among other ICT associations, she is also a member of WTN – World Technology Network. Among other awards she holds these honors : Technology Benefactor of Brazilian Army ; ICT Personally of the Year - by Telecom Infrastructure Association ; IT personality of the year - by ASSESPRO: Software & Services & Internet Companies Association ; Honorary Member - Brazilian National Software Companies Association (one of the two honorary members in 20 years) ; Honorary Citizen of Rio de Janeiro – by State Chamber of Representatives – for promoting Digital Inclusion and Software Development ; Public Personality of the Year – by Brazilian e-Commerce Association ; Honorary Member - Brazilian e-Commerce Association ; The 30 years Best Automation Women Executives by Brazilian Banking Association ; The ICT Most Influent Woman in the Country by Gazeta Mercantil . In 2009 she founded NEXTi a NGO that congregates over 70 women that hold key executive positions in ITC Companies established in Brazil. At the moment, NEXTi is under the process to become an accredited ICANN ALS. 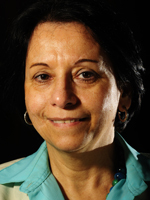 Ms. Scartezini was elected to membership on the ICANN Board in December 2004. Her three-year term ended with ICANN annual meeting in November 2007. On 30th September 2009 she was elected the ALAC Board Liaison for 2009/2010 and will take up her position at the close of the ICANN Board Meeting in Seoul, South Korea and serve until the close of the third ICANN Meeting of 2010.